President-elect Donald Trump’s favorite social media platform will livestream his inauguration, in partnership with PBS NewsHour. The livestream will begin at 11 a.m. ET Friday, Jan. 20, and it can be viewed via Twitter’s applications and here. Managing editor Judy Woodruff will anchor the coverage, which will also feature NewsHour correspondent John Yang reporting from the steps of the U.S. Capitol and Lisa Desjardins from the National Mall. A panel of guests will join Woodruff in the studio, including The New York Times columnist David Brooks, syndicated columnist Mark Shields, Cook Political Report’s Amy Walter, PBS NewsHour Weekend special correspondent Jeff Greenfield, American Conservative Union chairman Matt Schlapp, George Washington University Graduate School of Political Management interim director Lara Brown and @MoveOn senior advisor and national spokesperson Karine Jean-Pierre. Twitter is where news and politics are discussed in real-time every day, and we’re excited to collaborate with PBS NewsHour around this historic event to bring public broadcasting’s live coverage to Twitter. 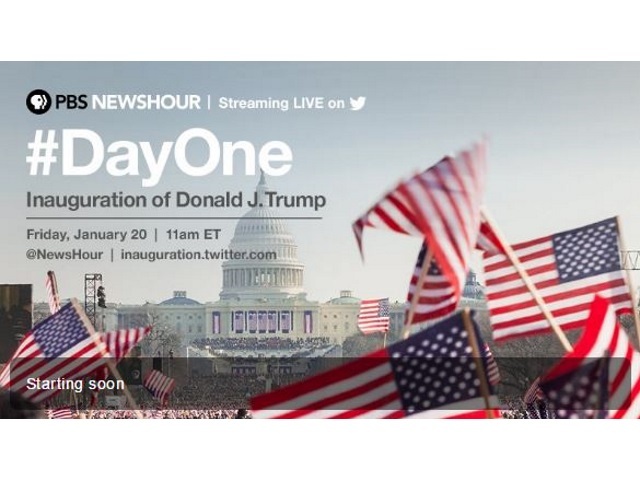 NewsHour’s broadcast will integrate dependable, thorough coverage with the live Inauguration Day conversation on Twitter. We are delighted to partner with Twitter for Inauguration Day coverage. The peaceful transition of power from one president to the next is a powerful moment in the American democratic process. And this year, it comes at a time when the country is embroiled in political discourse like we have rarely seen. Streaming public broadcasting’s thoughtful coverage on Twitter will allow more Americans to experience the inauguration and join in discussion around it. Readers: Do you plan to watch or livestream the inauguration?